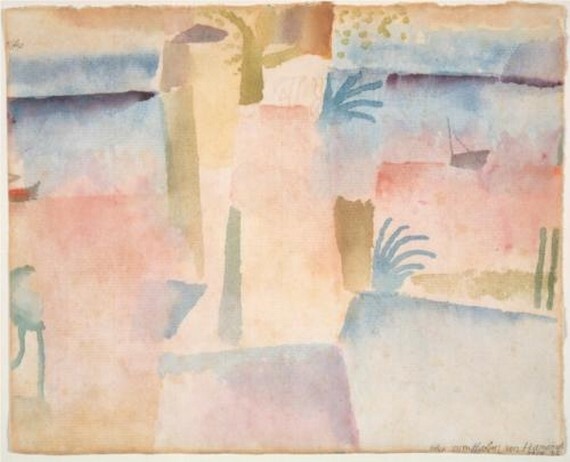 Paul Klee, the Swiss-German modernist painter, experienced epiphanies during the ‘student trip’ he took with two other young artists to Tunisia in 1914. It was there that he, deeply influenced by the color and the quality of the light (which other European artists have remarked on), he “began his path toward abstraction,” as the brochure of the NYC Metropolitan Museum notes. There is a real sense in which Klee became an artist in Tunisia, gaining spiritual confidence, especially from the old Islamic center of Kairouan, and learning from the encompassing night and the limpid daylight how to see things without being trapped by their forms. To that extent, Tunisia gave us Klee and a stream of German modernism. In 1920 Klee was called to teach at Bauhaus.